The Present book is of the supreme significance from four points of view. 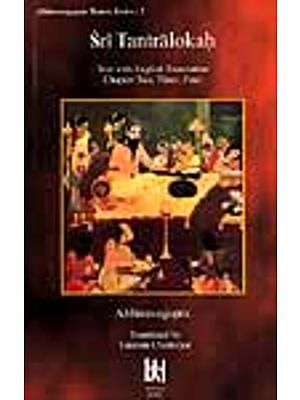 Firstly, it breaks a new ground in Indian philosophy. According to it, the Self is not simply witnessing consciousness as maintained by Sankhya, Patanjala Yoga, Vedanta, but an active force of Spanda. Secondly, the ultimate reality is not simply a logical system, a mysterious background of bloodless categories, but spanda or living, throbbing Energy, the Divine creative Pulsation, the source of all manifestation, physical or superphysical. It should be of particular interest to science which has now come to the conclusion that matter is only an expression of electrical energy. Spanda maintains that all energy is, in its ultimate analysis, only an off-shoot of spiritual energy. Thirdly, the work elaborates the dynamic side of consciousness and serves as a commentary on the Siva Sutra. Fourthly, it gives hint of a new kind of yoga for the realization of self. Dr. Jaideva Singh has re-edited the text and the commentary with the assistance of his guru Swami Laksmana Joo. 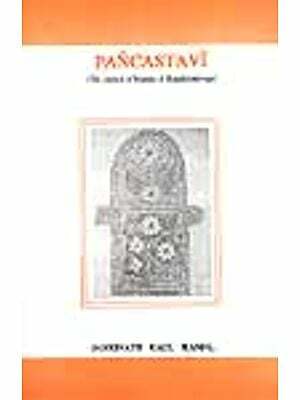 He has provided an English translation of both the text and Ksemaraja's commentary. He has thrown, in his notes, new light on many subtle points of the text and the commentary and given lucid exposition of each verse. JAIDEVA SINGH (1893-1986) was a great scholar in musicology, philosophy and Sanskrit. A former principal of Y.D. College. Lakhimpur-kheri, he served as Chief Producer in All-India Radio and among other posts acted as chairman of U.P. Sangit Natak Academi. He was awarded Padma Bhushan by the Government of India in 1974. After his retirement he settled in Varanasi to study with M.M. Gopinath Kaviraj. He dedicated the later part of his life to the study with Kashmir Saivism. He published several books in Hindi and English translations of Kashmir Saiva texts, such as Siva-Sutras, Spanda-Karika. 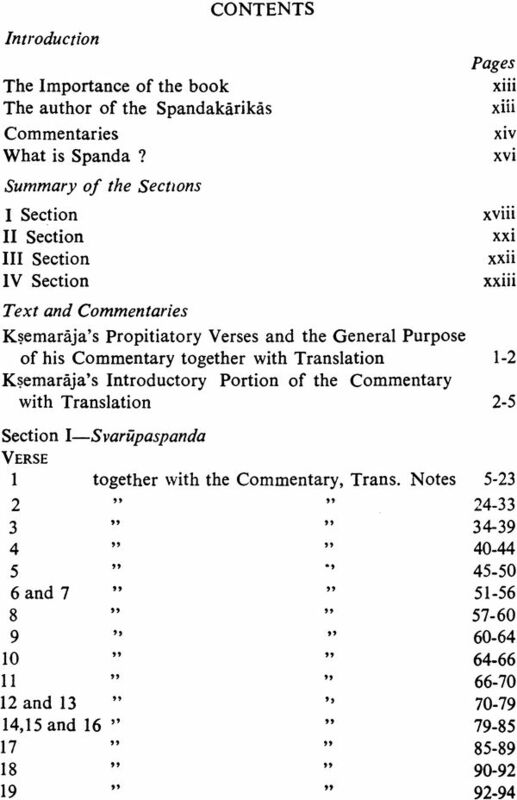 Ksemaraja has written a commentary on Spandakarikas, titled Spanda-nirnaya. He is fond of sesquipedalian compounds, long and windy sentences, but he is very profound in the comprehension of the subject and so cannot be ignored. 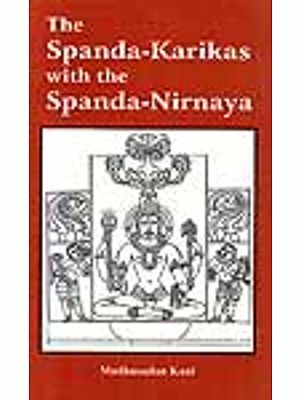 I have tried to provide a readable translation of both the karikas and the Spanda-nirnaya commentary. Each karika (verse) is given both in Devanagari and Roman script, followed by its translation in English. 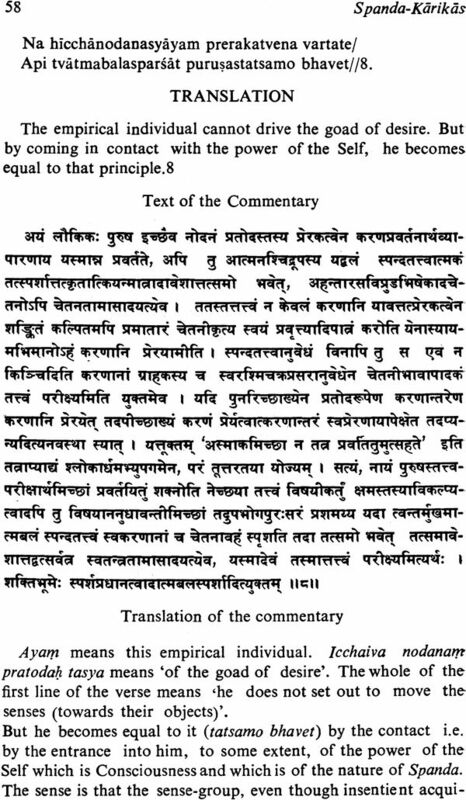 This is followed by Ksemaraja’s commentary in Sanskrit. Then follows an English translation of the commentary. After this, copious notes are added on important and technical words, Finally, I have given a running exposition of each karikas in my own words. The text and commentary published in the Kashmir Series of Texts and Studies have been adopted. A few misprints that occurred in the above edition have been corrected with the assistance of Svami Laksmana Joo. I am deeply indebted to him for his luminous exposition of this important text. A long Introduction has been given in the beginning of the book, and a glossary of technical terms and an Index have been appended at the end. Spanda Karikas is one of the important works of Kashmir Saivism. The doctrine of Spanda is scientific. Modern scientists have discovered that the world was created from the vibration of the first explosion and that the universe is still expanding. Yet so far they have not been able to find out how the first explosion occurred. However, the ancient scriptures of the Spanda doctrine have always contained the knowledge that this vibration is the Spanda or throb of the Absolute Reality the Universal Consciousness which is also called Siva. The world came into existence with the throb of His opening eye. Gangesvara Maharaja has described Lord Siva as having the mudra of expanding universe. It is a matter of great satisfaction to know that the work which reveals this truth is now available in English. Modern scientists will definitely make use of it to enhance their knowledge. In America when I meet with scientists, I always refer to the a doctrine of Spanda. They express interest and desire to read about it. I welcome Jaideva Singh, who helps to spread this supreme wisdom of Kashmir, In the company of great beings he has acquired the knowledge of the truth. He has also translated and explained in English such great works of Kashmir Saivism as Siva Sutras, Pratyabhijnahrdayam, and Vijnana Bhairava. In this way, he has helped the people of English speaking countries who desired to know this doctrine. I hope his work in this direction continues for along time. Let the humanity of the world benefit by the knowledge contained in this work. 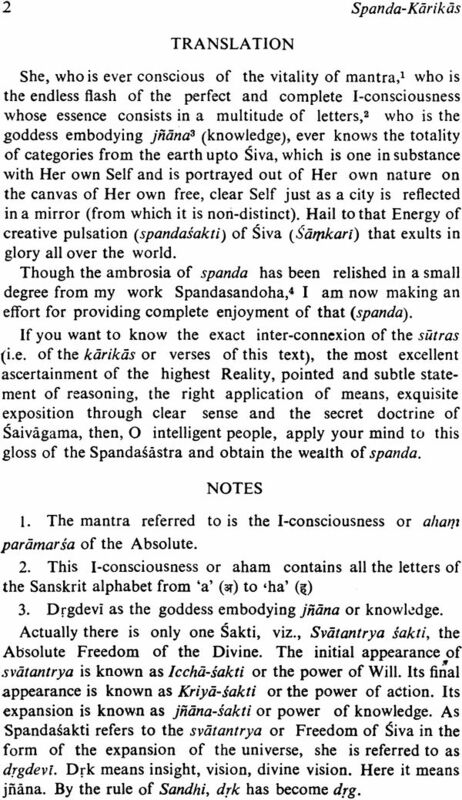 Spandakarikas are a sort of commentary, on the Siva-sutras. "The word karika means a collection of verses on grammatical, philosophical or scientific subjects.' The word spanda literally means a •throb.’ It connotes dynamism or the dynamic aspect of the Divine, the Divine creative pulsation. 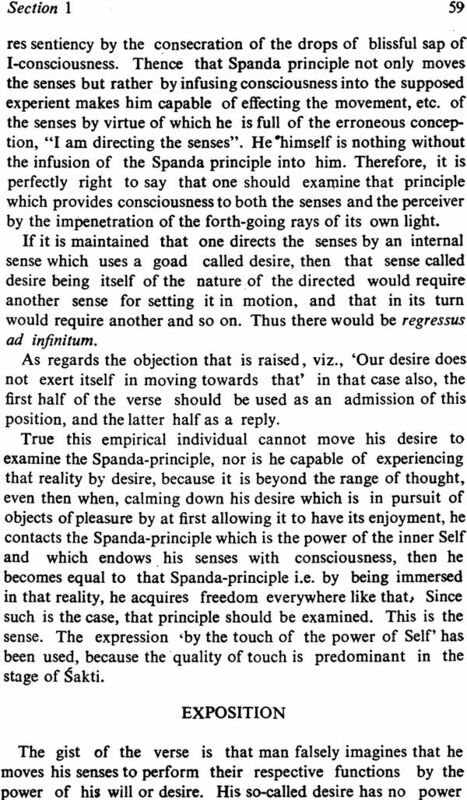 The Self, according to Spandakarikas, is not simply a witnessing consciousness, but is characterized by both cognition and activity. He who is in communion with this active Self can alone rise to the status of his highest being. The opinion regarding the authorship of Spandakarikas is divided. According to Bhaskara and Utpala Vaisnava or Bhatta Utpala, both of whom flourished in the second and third quarters of the 10th century A.D., the author of these, karikas was Kallata who was the chief disciple of Vasugupta. 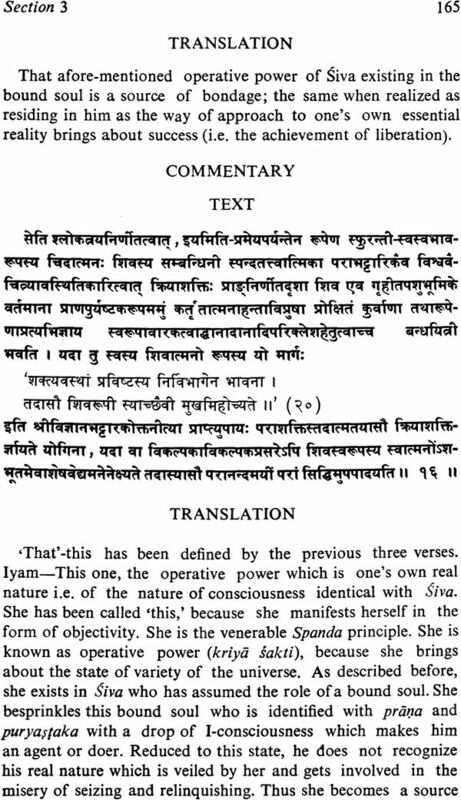 Bhaskara says in his Siva—sutra—varttika that Kallata wrote a commentary, called Spanda-sutras on the three sections of the Siva-sutras, and a commentary, called Tattvartha-cintamani on the fourth section of the Siva-sutras. 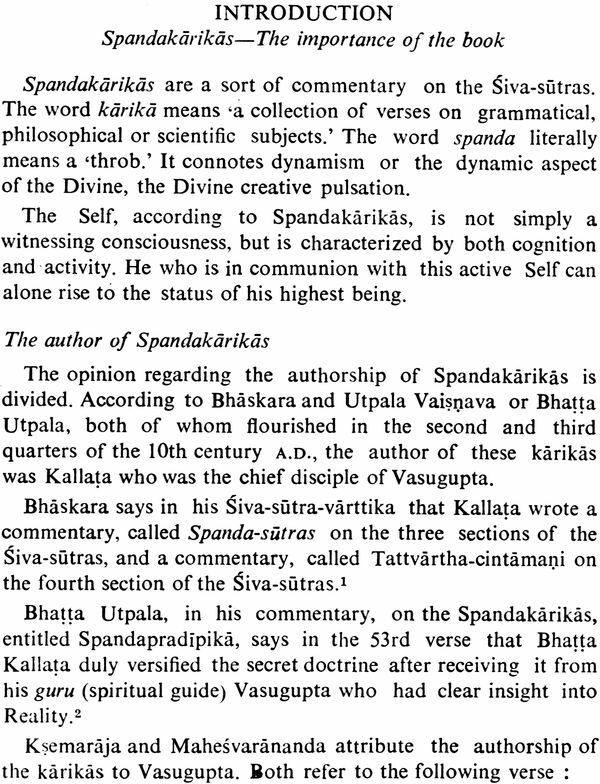 Bhatta Utpala, in his commentary, on the Spandakarikas, entitled Spandapradipika, says in the 53rd verse that Bhatta Kallata duly versified the secret doctrine after receiving it from his guru (spiritual guide) Vasugupta who had clear insight into Reality. Ksemaraja and Mahesvarananda attribute the authorship of the karikas to Vasugupta. Both refer to the following verse : "As on the attainment of this treasure of knowledge which is difficult of attainment, and on its being well, preserved in the cave of the heart, it has been for the good of Vasugupta, so also on the attainment and on its being well preserved in the cave of the heart, it would always be for the good of all." This verse is, however, not found in the recension of Bhatta Utpala, Kallata and Ramakantha. On the basis of this verse, some writers have concluded that Kallata was the author of the Spandakarikas. But Kallata specifically says Yat Spandamrtam Vasuguptapadaih drbdham, i.e. 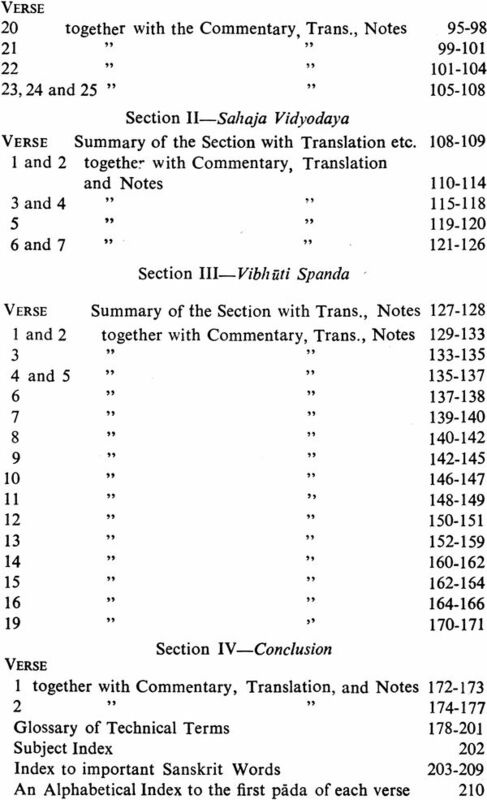 ‘the Spandakarikas which were composed by Vasugupta. spandamrtam is only another name for Spandakarikas. The word drbdham” only means strung together, arranged composed’ and Vasuguptapadaih only means by revered Vasugupta.’ Regarding himself, Kallata only claims to have brought it to the notice of the people. "Vasugupta-padaih drbdham" clearly shows that the Karikas were composed by Vasugupta. 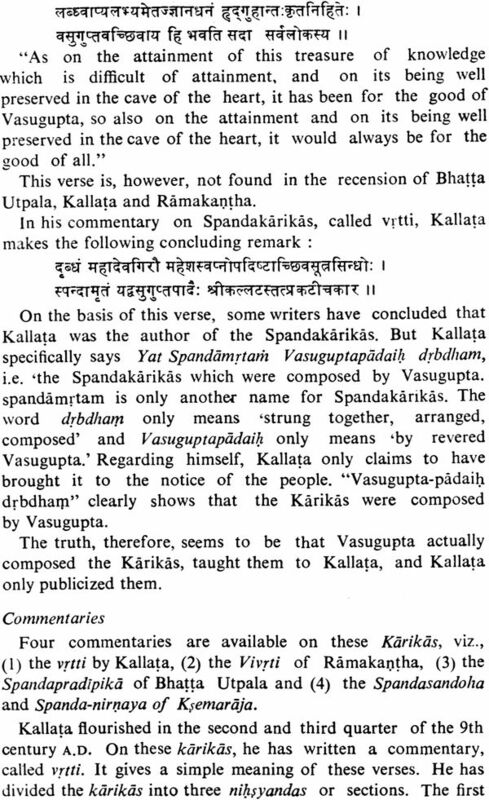 The truth, therefore, seems to be that Vasugupta actually composed the Karikas, taught them to Kallata, and Kallata only publicized them. 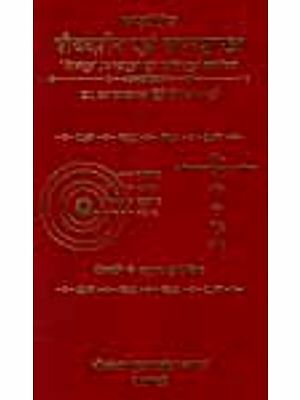 Four commentaries are available on these Karikas, viz., (1) the vrtti by Kallata, (2) the Vivrti of Ramakantha, (3) the Spandapradipika of Bhatta Utpala and (4) the Spandasandoha and Spanda-nirnaya of Ksemaraja. Kallata flourished in the second and third quarter of the 9th century A.D. On these karikas, he has written a commentary, called vrtti. It gives a simple meaning of these verses. He has divided the karikas into three nihsyandas or sections. The first nihsyanda contains twenty-five verses, and is designated by him as svarupa-spanda. It gives the essential nature of spanda. 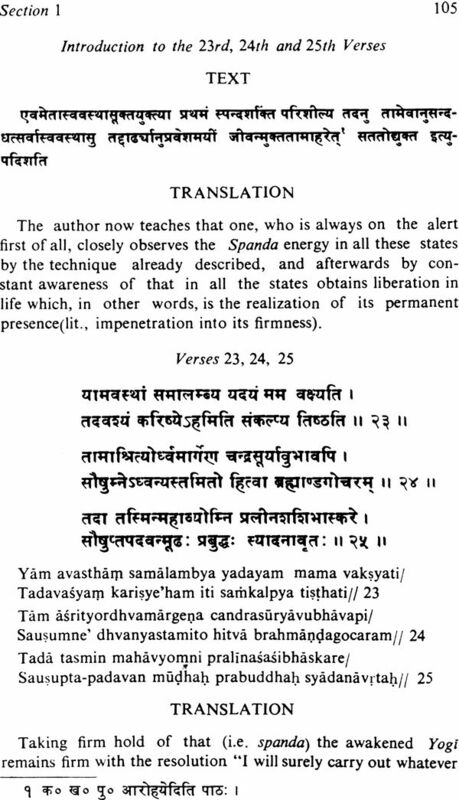 The second section is named by him sahaja-vidyodaya i.e. 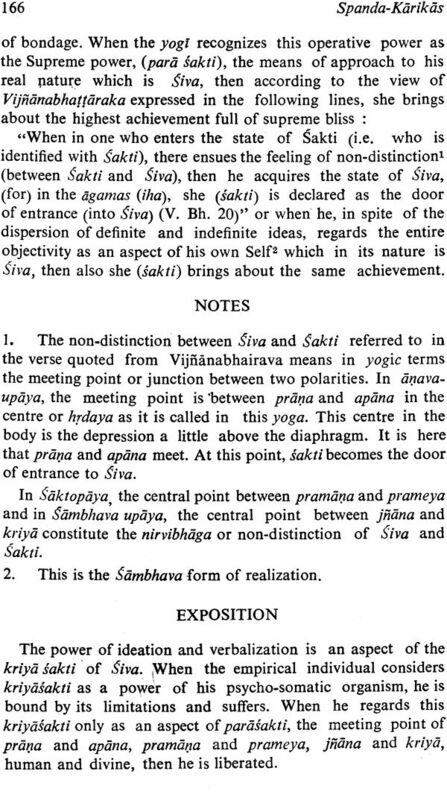 the emergence of Sahaja-vidya. It contains seven Karikas (verses) from 26 to 32. The third section is named vibhuti-spanda or —.supranormal powers acquired through spanda. It contains twenty verses from 33 to 52. 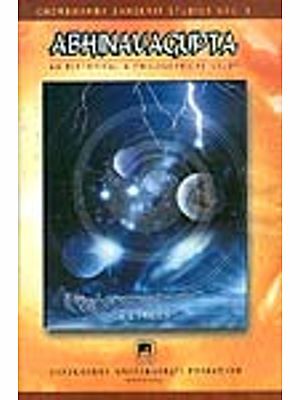 Ramakantha wrote a commentary, called Vivrti. He calls himself a pupil of Utpaladeva, the grand teacher of Abhinavagupta. He, therefore, flourished in the second and third quarters of the 10th century A.D. He closely followed the vrtti of Kallata in his interpretation of the karikas. 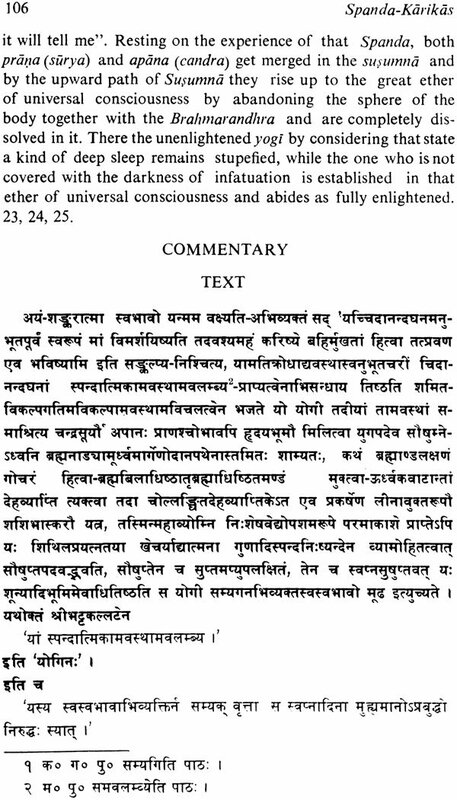 He himself says so in the colophon of his commentary Sampurnaiyam vrtryanusarini spandavivrthi. This Spanda-vivrti closely following the vrtti (of Kallata) is finished." His division, however, of the sections of the Karikas is different. His first section includes sixteen verses and he names it vyatirekopapattinirdesah i.e. the section that points out the proved distinction of the knower from the known. 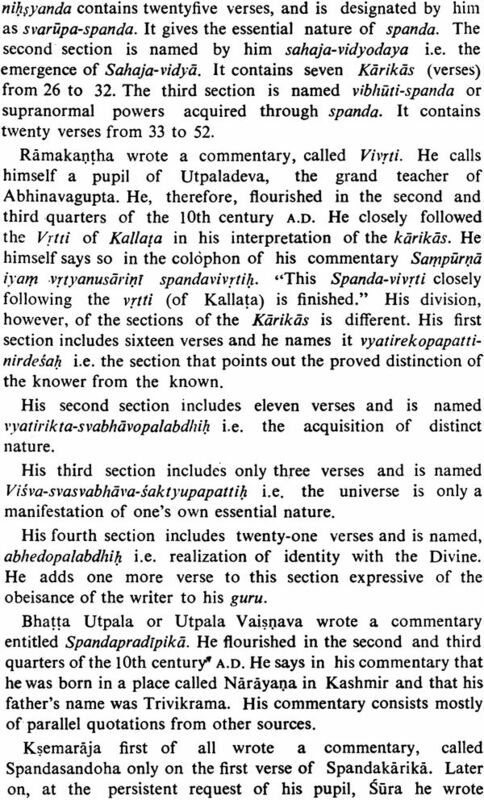 His second section includes eleven verses and is named Visva-svasvabhava-saktyupapattih i.e. the acquisition of distinct nature. 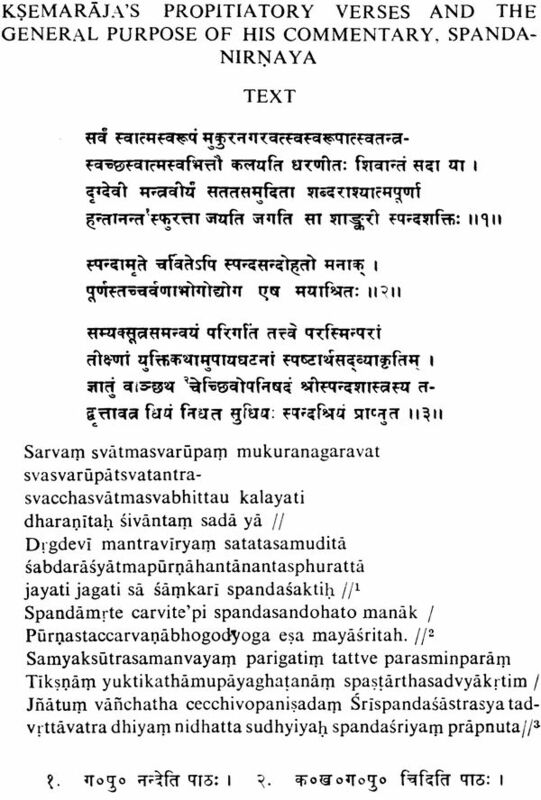 His third section includes only three verses and is named Visva – svasvabhava-saktyupapattih i.e. the universe is only a manifestation of one’s own essential nature. His fourth section includes twenty—one verses and is named, abhedopalabadhih i.e. realization of identity with the Divine. He adds one more verse to this section expressive of the obeisance of the writer to his guru. Bhatta Utpala or Utpala Vaisnava wrote a commentary entitled Spandapradipika. He flourished in the second and third quarters of the l0th century A.D. He says in his commentary that ht- was born in a place called Narayana in Kashmir and that his father’s name was Trivikrama. His commentary consists mostly parallel quotations from other sources. Ksemaraja first of all wrote a commentary, called spadasandoha only on the first verse of Spandakarika. Later on, at the persistent request of his pupil, 'Sura he wrote Spandanirnaya, a commentary on the whole book. He flourished in the last quarter of the 10th and first quarter of the 11th century. He was Abhinavagupta’s cousin and pupil. 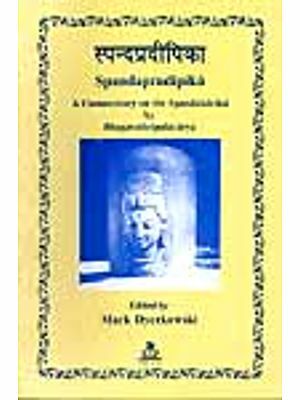 His commentary on Spandakarika is exceedingly scholarly and bears the stamp of his teacher’s profundity. According to him, Bhatta Lollata had also written a commentary on these karikas, but that is not available now. He has divided the karikas into four sections. The first section consists of twenty-five verses. Like Kallata he has named this section as svarupa-spanda. His second section consists of seven verses, and like Kallata, he names it Sahaja— vidyodaya. 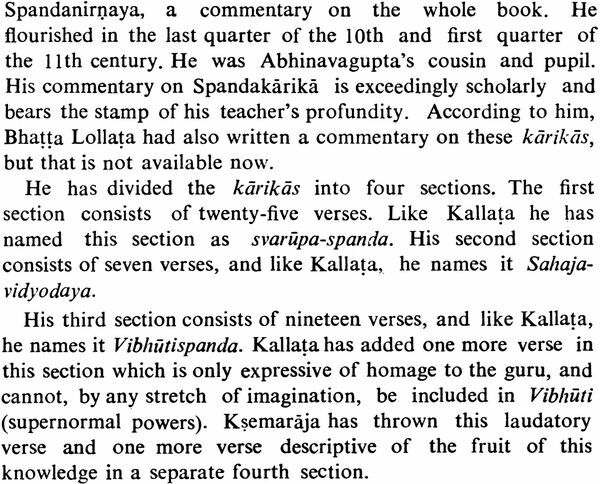 His third section consists of nineteen verses, and like Kallata, he names it Vibhutispanda. Kallata has added one more verse in this section which is only expressive of homage to the guru, and cannot, by any stretch of imagination, be included in Vibhuti (supernormal powers). Ksemaraja has thrown this laudatory verse and one more verse descriptive of the fruit of this knowledge in a separate fourth section. 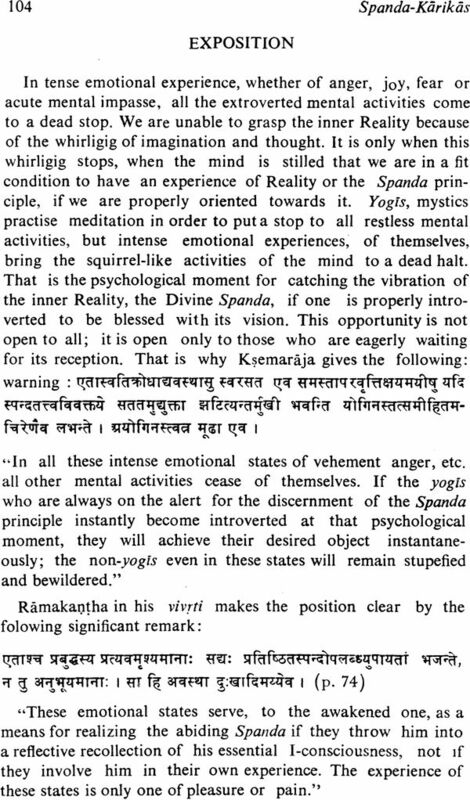 "Spandana means some sort of movement. If` there is movement from the essential nature of the Divine towards another object, it is definite movement, not some sort, otherwise, movement itself would be nothing. Therefore, Spanda is only a throb, a heaving of spiritual rapture in the essential nature of the Divine which excludes all succession. This is the significance of the word Kincit in kincit calanam which is to be interpreted as "movement as it were." Movement or motion occurs only in a spatio-temporal framework. The Supreme transcends all notions of space and time. Spanda, therefore, in the case of the Supreme is neither physical motion, nor psychological activity like pain and pleasure, nor pranic activity like hunger or thirst. It is the throb of the Divine I-consciousness (vimarsa). The Divine I consciousness is spiritual dynamism. It is the Divine creative pulsation. It is the throb of Siva’s svatantrya or absolute Freedom. If Spanda is not any kind of movement, how can the application of this word be justified to the activity of the Supreme, for the word Spanda means ‘a somewhat of motion?’ This is the explanation offered by Abhinavagupta. …Spandana means a somewhat of movement. The characteristic of somewhat’ consists in the fact that even the immovable appears ‘as if moving,’ because though the light of consciousness does not change in the least, yet it appears to be changing as it were. The immovable appears as if having a variety of manifestation. Spanda is, therefore, spiritual dynamism without any movement in itself but serving as the causa sine qua non of all movements. The Divine is termed the great Lord (Mahesvara) because of His ever-present, immutable Self-awareness (vmarsa). That self awareness in its absolute Freedom constitutes Divine (suddha- pure) knowledge and activity.” Spanda is only another name of Self-awareness or Vimarsa. As Ksemaraja puts it, Spanda also connotes the svatantrya or absolute Freedom of the Divine (Bhagavatah svatantrya-saktih). Vimarsa, parasakti, svatantrya, aisvarya, kartrtva, sphuratta, sara, hrdaya, and spanda are synonymous in Saivagama. While the verses of the text are practically the same in all the editions available, they have been divided under different sections somewhat differently by each editor and commentator. The topics under each section are given in this book as described by Ksemaraja. VERSE Summary of the Section with Translation etc.